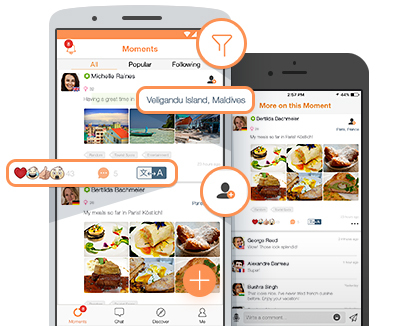 Now, you can share stories, pictures and audio clips with the world! With the latest version of Hello Pal, you can create your very own MOMENTS feed: a string of public posts which can include your thoughts in writing, photos and audio clips! With Hello Pal, we’ve given you the whole world at your fingertips, and now with MOMENTS, we’re giving you a window to the world! Follow users from different countries to learn about local customs, food and travel destinations. You can also use the filter to view Moments in a specific language, or view Moments about a certain location or category. You can also start a dialogue with someone by adding comments right below their Moments – you can even add reactions to their posts! Post your own Moments to give other users a peek into your own life. Let others know what makes you, your language, your city or town, and your local food unique! add audio recordings to your Moments, too! And if you see Moments which are posted in a language you can’t understand, don’t worry – Hello Pal’s amazing translation feature is here to help! Hello Pal also got itself a shiny new look! We decided to give you a brand new look to match our brand new features! 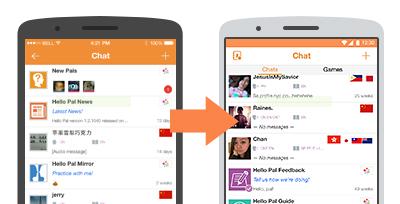 Hello Pal is looking sharp as ever: we’ve taken some tips from you and made the app more intuitive and sleek. We also implemented some changes on the Chat and Games screen layout to help make it so much easier for you to access your messages and game notifications! So we hope to see you all in Hello Pal!